LVMH has announced the eight finalists of its 2019 Prize for Young Fashion Designers. In the sixth year since its inception, 1700 applications were received from designers from 100 nations. For this year’s edition, eight candidates were selected to present themselves to the jury in a final round. 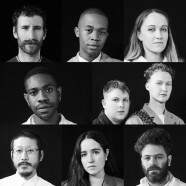 The jury consists of Jonathan Anderson, Kris Van Assche, Maria Grazia Chiuri, Artistic, Nicolas Ghesquiere, Marc Jacobs, Humberto Leon, Carol Lim, Clare Waight Keller, Delphine Arnault, Jean-Paul Claverie, Bernard Arnault, and Sidney Toledano. The winner of the Prize will be announced in June after the jury meets with the finalists at The Fondation Louis Vuitton in Paris. The winner can look forward to the prize money of 300,000 euros, and he/she will receive support from LVMH experts as they expand their own fashion label. 1. ANREALAGE by Kunihiko Morinaga (Japanese designer, based in Tokyo). Womenswear, showing in Paris. 2. BETHANY WILLIAMS by Bethany Williams (British designer, based in London). Gender-neutral fashion, showing in London. 3. BODE by Emily Adams Bode (American designer, based in New York). Menswear, showing in New York. 4. HED MAYNER by Hed Mayner (Israeli designer, based in Tel Aviv). Gender-neutral fashion, showing in Paris. 5. KENNETH IZE by Kenneth Izedonmwen (Nigerian designer, based in Lagos). Gender-neutral fashion, showing in Lagos. 6. PHIPPS by Spencer Phipps (American designer, based in Paris). Gender-neutral fashion, showing in Paris. 7. STEFAN COOKE by Stefan Cooke & Jake Burt (British designers, based in London). Menswear, showing in London. 8. THEBE MAGUGU by Thebe Magugu (South African designer, based in Johannesburg). Womenswear, showing in Johannesburg.